Thallus: foliose, adnate to loosely adnate, 4-7 cm in diam., irregularly lobate lobes: subirregular, elongate, plane to subconvex, separate, contiguous to somewhat imbricate, (0.5-)1.5-4 mm wide, not lobulate; apices: subrotund to subtruncate, smooth to crenate, eciliate upper surface: light yellow to yellow-green, smooth, shiny, epruinose and emaculate, moderately to densely isidiate isidia: initially globose, soon becoming subcylindrical and irregularly inflated, unbranched or sparsely branched, 0.07-0.1 mm in diam., 0.1-0.5 mm tall; tips: weakly to strongly epicorticate, brown, + erumpent; soralia and pustulae absent medulla: white, with continuous algal layer lower surface: pale to medium brown, plane, moderately to densely rhizinate; rhizines: pale brown, simple, 0.2-0.5 mm long Apothecia: rare, substipitate, 2-7 mm wide, laminal on thallus; disc: cinnamon-brown to dark brown; margin: smooth, pruina absent asci: clavate, 8-spored ascospores: hyaline, simple, ellipsoid, 9-10 x 4-5 µm Pycnidia: rare, immersed conidia: bifusiform, 5-6 x 1 µm Spot tests: upper cortex K-, C-, KC-, P-; medulla K-, C-, KC-, P+ yellow Secondary metabolites: upper cortex with usnic acid (major); medulla with psoromic acid (major) 2'-O-demethylpsoromic acid (minor), and usually subpsoromic acid (trace). Substrate and ecology: on acidic rocks, often in open, arid habitats World distribution: most common in southwestern North America and also reported from Ecuador in South America Sonoran distribution: common at lower elevations in Arizona, southern California, Baja California Sur, Chihuahua and Sonora. 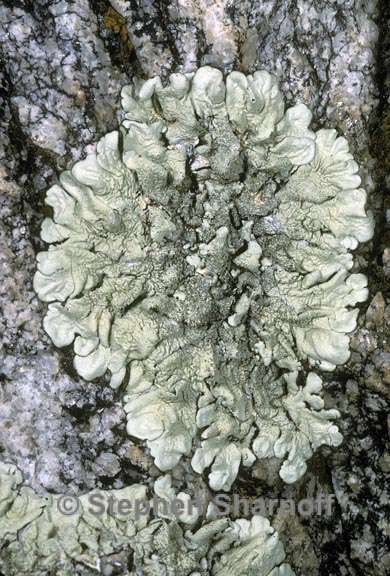 Notes: Xanthoparmelia lavicola is a common isidiate species with a pale brown lower cortex and psoromic acid as the major medullary metabolite. In the interior deserts of central Arizona, X. lavicola often has narrower lobes and a higher degree of adnation than southern Californian populations.